Dream Catcher Cottage~This is the One You've Been Looking For!! Our cottage is tucked away in a quiet community of mostly cottage homes and retired couples. Panoramic sunrise views of Green Lake in its full fall splendor can be seen from any room in the house. Relax with a beverage while sitting on the swing on the wraparound porch or from inside in front of the fireplace on cold nights. If you are sharing your vacation with family or friends, you will want to draw straws as to who sleeps in the second floor master suite, from which you have beautiful lake views. Upstairs you will also find a master bath, a cozy 4th bedroom, a TV sitting room and a computer/office area. Two bedrooms and two baths, a complete kitchen, two dining areas as well as the warm and inviting living room make up the downstairs. Gourmet dining, shopping and entertainment await you in Traverse City, just 13 miles away. We are the close neighbor of the internationally acclaimed Interlochen Center for the Arts, located just across Green Lake. The quaint village of Interlochen boasts a sandwich shop,an ice cream parlor and Maddy's Tavern, a local favorite with great food. The close-by Hofbrau offers a variety of craft beers. Drive a half hour in the opposite direction to enjoy the quaint little towns of Empire and Frankfort with their sweeping vistas of Lake Michigan along the Sleeping Bear Dunes National Shoreline. Check out the hiking and biking trail maps in the cottage for a list of the many beautifully wooded trails in the area. If fishing is your pleasure, 2000 acre, all-sport Green Lake is just one of the 50+ area lakes that boast some of Michigan's best fishing and it's right outside your door.Whether you are looking for a relaxing getaway or an opportunity to enjoy your favorite sport, this is the place you've been looking for! We are a family of four. We purchased this cottage in 2008 for our own enjoyment and to share with family, friends and now our guests. We have spent many good times here at the Dream Catcher and have made many memories. We hope that you will have a memory filled vacation if you choose to stay with us! 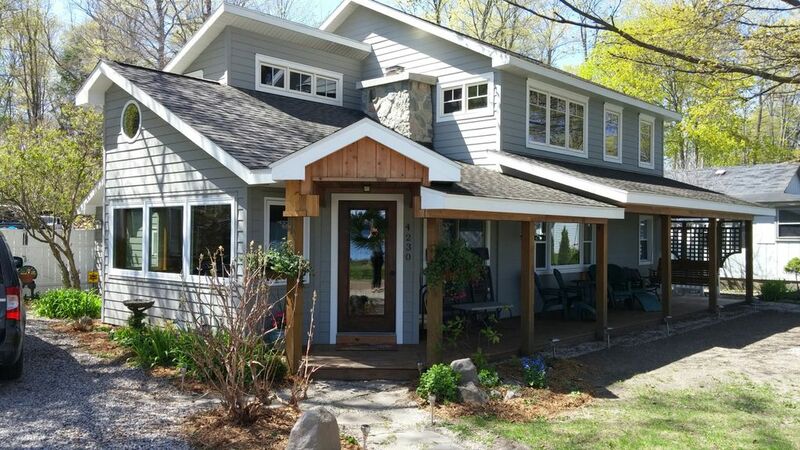 This cottage is located across the lake from the world renown Interlochen Center for the Arts. In addition to being able to attend concerts of these extremely gifted student actors, artists and musicians, the academy also brings in well known musicians during their summer concert series. Click on the web link for concert ticket information or listen to the open air concerts for free while enjoying an ice cream walking or biking through the surrounding campus grounds. There are no homes or buildings obstructing your panoramic view of the lake from almost all rooms in the house. Cooking Utensils & Linens provided, BBQ Grill (propane), 2 Bikes are provided. 100% refund if cancelled at least 60 days before arrival date. 50% refund if cancelled at least 30 days before arrival date. Green lake right across the street. Cottage was very well stocked. Very comfortable! The cottage is nice on first appearance, as you get settled in you begin to see the flaws, carpentry not finished, some windows do not work, very hard water with a sulphur smell that stays with you all day after you bath. We really enjoyed our stay. Very comfortable cottage. Awesome view and perfect weather. We spent one week at the Dream Catcher with my Husband's two Brothers and their Wives. This "cottage" had plenty of room for the 3 couples; it fit us perfectly. We took turns cooking breakfasts and dinners, which made meals more enjoyable. We had 4 bonfires, thanks to Fred and his endless woodpile. Walter gave us a tour of the lake on his pontoon, which was super nice. The lake is crystal clear, which is perfect for floating on a raft. We shall return! This cottage proved to be a wonderful space to spend a fall weekend. It was perfectly accommodating for 8 adults - 3 full bathrooms, 4 separate sleeping areas, and a kitchen table big enough to fit everyone comfortably. The fireplaces throughout were a nice touch and there were plenty of blankets, towels, dishes, and utensils to make it feel like a home away from home. The property owner was very responsive, proving easy to work with helpful along the way. Plus, the house was tucked away amidst gorgeous fall leaves with a beautiful view of the lake. Would definitely consider staying again. Perfect For A Girls Getaway! The Dream Catcher worked beautifully for our group of five adults and two children. So many rentals claim a well stocked kitchen and end up disappointingly unequipped, not the Dream Catcher, there were plenty of dishes and cooking supplies! The cottage was clean and well maintained and we found a bottle of wine waiting for us when we arrived, a lovely touch. Bikes are available to ride to the Interlochen Arts Academy just 2 miles away. Listen to 'free' concerts on campus outside Kresege auditorium at Interlochen Center for the Arts or purchase tickets to enjoy incredible evening performances as you watch the sun set on the lake from your seats.